What a difference a day makes! Today was a hot day! Not sweltering, but just plain hot. Bright and sunny. Thank God there is a lot of shade at Williamsburg so it was not so bad. The boys wanted to dive right in to their RevQuest game and they needed to meet a character at some location where the person would be every 30 minutes on the quarter hour. We tried hard to get the kids to take a 30 minute walking tour, but they wanted to go right for that. I got them at least to agree to stop at one location and hear all about guns of that time period. Mix all of the ingredients except the milk. Add a small amount of water until everything has dissolved and mix well. Wisk in the milk slowly and then heat on a stove until just starting to boil. Serve hot. After coming back to the resort the kids went to the pool and I went to a grill and prepared burgers, dogs, and corn from NJ. Everyone enjoyed! Tomorrow we go to Jamestown and I am hoping that they also have some things to keep the kids interested. As for the trivia question yesterday, the answer is that the ring was called the Culper Ring. Washington wanted it called the Culpepper ring, but the men did not like that so they shortened it to Culper ring. Today’s question is (without Google!) “Name two Virginians who signed the Declaration of Independence. Yesterday, we started our 2014 vacation and took a long drive to Williamsburg, VA. As I said in my last post, my in-laws drove down as well in their own car and this allowed us to split the kids up between the two cars! For the first few hours, Shayna went in my in-laws car, and the boys were with us. For this part of the trip, the boys were amazing. They were each playing on their DS and having some sort of contest with each other. They were calm and mostly quiet. This allowed Marsha and me to actually talk! I cannot recall the last time we able to do that. We stopped in Delaware for lunch and Avi switched cars with Shayna. The rest of the trip was also fine. Shayna can get a bit giggly, but it was really fine. Marsha and I got to listen to a recording of the Billy Joel / Howard Stern interview that was on Sirius XM radio. If you have not heard this, get a copy of the recording and listen to it. It was incredible! After a little bit of traffic, we made it to Williamsburg just in time for dinner. My cousin Stacey, who lives in Virginia Beach told us about this great restaurant in Williamsburg called “Food for Thought“. This place is amazing. The food is great, and they take vegetarian food seriously! They are not a vegetarian restaurant, but they have a lot of vegetarian and vegan selections, and they will often substitute vegan chicken for other proteins on the menu. I had Ahi Tuna which was a special that night (Ah-May-Zing!) but Marsha had Pad Thai with vegan chicken that was great too. The best was when they made vegan chicken parm for Noam even though it was not on the menu. Everyone loved the meal and perhaps we will go there again. After dinner we checked into the hotel. The hotel is part of our time share company so we expected a nice place. We were not disappointed. The suite is smaller than we are used to from a time share resort, but it is very nice. Our two bedroom suite ended up being a three bedroom suite which was a very nice surprise. We unpacked and got the kids to bed and we got a chance to just relax for a couple of hours. We did not set an alarm for this morning, but were awakened by some machine outside (leaf blower?). We still took our time and got over to Colonial Williamsburg by 11 or so. We picked up our tickets and saw two short intro movies about the city. It turns out that they have a little game called RevQuest for the kids. Basically, they get a folder with clues and cyphers and they get to play “spy”. Avi and Noam really got into this. So much so that at times, we did not get to do anything but let them play the game! We did get to see a few things and all in all, the kids were great. The boys got about half way through the game, and we ventured our way to the art museum where they had a kids activity about spy craft and they got to try cyphers and other things that spys would use. One thing that was good is that they sell re-fillable cups here that give you free refills for the entire season! We purchased two of them and there is even one place where they will fill it with ice cream or a slushy! Needless to say the kids enjoyed that. That’s pretty much it for now. 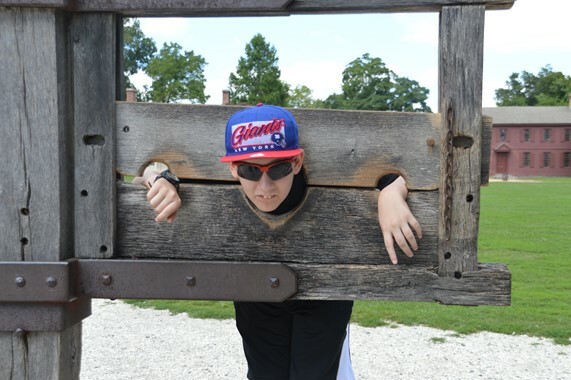 Tomorrow we are going back to Colonial Williamsburg to see some more and let the kids play more of the spy game. Hopefully, Marla won’t mind me copying her vacation trivia game. Today’s question is (without google) what was the name of the Revolutionary spy ring that Washington created, and what is the origin of the name? 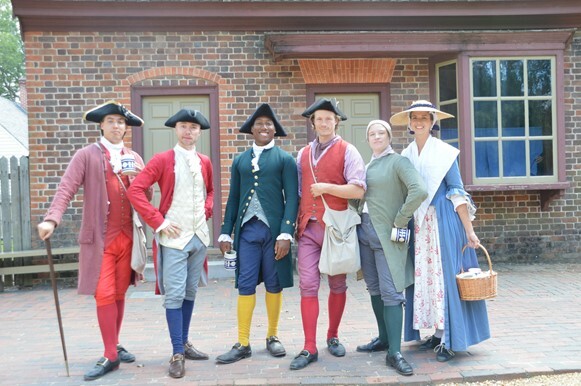 On Sunday the Goldwasser clan with Kheel grandparents in tow are going on a vacation to Williamsburg, Virginia. I am sure we will have a great time and hopefully the kids will learn something too! While this would be a nice topic for my blog today, sadly it is not. Hopefully I will blog about the trip before, during, and after, but for now I am going to talk about a much more serious issue. Let me start with a little background. I am very lucky to have travelled to (or through) almost all of the contiguous 48 states. I went cross-country twice, once with my family in 1984 and once as a USY on Wheels staff member in 1989. I have also travelled other places in the country since then and even had a few days in Paris! During all of those trips there is one thing that I can say very proudly, that I wore my Kippah every day while on vacation. Those who know me, know that I wear my Kippah all the time. I started wearing the Kippah when I came back from USY Israel Pilgrimage and I have never stopped. As I said, I have been in almost every state of the US and Paris France (I need to go to more places in Europe!) and never once did I have an issue with wearing the Kippah, and never once did I even think that perhaps I should not wear it. For sure, there were times when I had a baseball cap on as well as my Kippah, but those cases were because of the hot sun, not because I wanted to take off the Kippah. And in those cases there were plenty of times I had the cap off. Now I am facing a dilemma that I never thought I would ever face. Should I wear my Kippah during this trip south? Before going further, I will say right from the start that I have not made any decision on this. Why am I having this internal crisis? Many of my friends probably are seeing the same things on Facebook that I have been seeing. Throughout Europe there have been major anti-Semitic acts almost on a daily basis. People are defacing Synagogue and Jewish businesses with swastikas, people are harassing Jews, and people are even pulling Israel food from the shelves in stores, and even pulling kosher foods that are not Israeli produces. What I am seeing on Facebook scares me to no end. I feel like I am seeing the 1930 all over again! One can quickly say, “But that is in Europe. In the US that could never happen.” And until recently I might have been inclined to agree with that. Over the past month or so there has been a major upswing in anti-Semitic activity in the US. In Seattle there was a major protest where participants called for the destruction of the Jewish state and people nearby heard things like “the Jews killed Jesus” and “kill all the Jews.” In Oakland, CA this week dock workers refused to unload an Israeli cargo ship and there are groups planning on doing the same in Seattle and Vancouver. For those who say that this is anti-Israel, not anti-Semitic, they need to have a quick lesson in world history. In truth, there anti-Israel IS anti-Semitism, plain and simple. Just look at these protests. If it were only anti-Israel, why would you hear “the Jews killed Jesus”? In Europe it is even clearer that the protests are anti-Semitic and not anti-Israel. Over 2000 French Jews have moved to Israel in the past number of months, compared with a few hundred the same time last year. That says a lot. There is some encouragement. Unlike the 1930s, we are not seeing state sponsored anti-Semitism. We are seeing heads of state making public statements against anti-Semitism. This is a good thing. We are seeing the American press talking in terms of anti-Semitism. This is also a good thing because the American press (some of it, not all) seems to be coming to the realization that anti-Israel is actually anti-Semitism. So I am still unsure about wearing my Kippah. One the one hand, I always wear it and I should continue to do so. On the other hand, I don’t want to put my family in a situation where people will start harassing us over what is going on in Israel. My post title gives me another option to wear a baseball cap the entire time, but what message am I saying by doing that? What my final decision will be remains to be seen, and perhaps I will blog about it before we leave, but for now, I want to hear what my friends have to offer about this. As some may know from my past blogging, I love to cook and I often blogged about recipes and other items of culinary interest. This summer we decided to buy into a CSA. For those who have never heard of this, or is not sure what it is, basically local farms will sell shares of their crops to the local community. Each week you get a basket full of produce and of course get to have fun coming up with great new ways to prepare said produce. 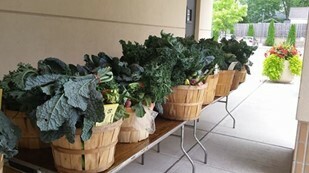 Because we were able to get over 10 people to buy in, we also have the farm deliver the produce to our Synagogue and everyone can come pick up there, which makes it very easy. Our CSA is 20 weeks and the farms grows an eclectic list of fruits and vegetables. That is a lot of food and we should be able to get through most of it. If we cannot eat or cook it during the week ahead, we will freeze it. Here is some ideas on what we might do with the produce this week. For the kale we are going to make Kale chips. If you do this right they are just as good as potato chips (well, not AS good, but pretty good). It is a very simple recipe. Take a small bunch of kale and take out the thick stems. Tear the leaves into pieces and then coat with ½ – 1 Tablespoon of oil. Work the oil in with your hands to get every piece covered. Place in a single layer on parchment lined baking sheets and bake in a 300 degree oven for 10 minutes. Turn the sheets and bake for 15 more minutes. Let the chips rest for 3 – 5 minutes before eating or bagging. You can season the kale with almost any spice before baking, but I think just a little kosher salt will be good. Last week we got the same amount of grape tomatoes. Here is a recipe (from andreasrecipes.com) that I used with them. 1. Roasting the tomatoes: Preheat the oven to 375° F. Put the grape tomatoes into the foil-lined baking pan. Pour the olive oil over the tomatoes, and sprinkle with the dried basil and the sea salt. Shake the pan from side to side to get all the tomatoes coated with the oil and seasonings. Roast for about 90 minutes, until the tomatoes are starting to shrivel. Turn off the heat and leave the tomatoes in the oven while you prepare the rest of the vegetables. 2. In the nonstick pan over medium heat, sauté the onions in the olive oil until the onions are translucent. Add the garlic, green pepper, yellow pepper, olives, and mushrooms. Stir until all the ingredients are distributed and coated with the olive oil. Continue cooking until the vegetables are heated through and just starting to soften. 3. Remove the tomatoes from the oven and pour them along with all the olive oil and seasonings into the pan with the vegetables. Toss in the fresh chopped basil and stir and cook for another 2 to 3 minutes. Serve over cooked linguine and garnish with fresh grated Parmesan. Last week we had gotten peppers also so I used a lot of what we had in the one recipe. I hope you will try this recipe it is so delicious. If you do make it, PLEASE do not discard the oil that the tomatoes roasted in. It makes a remarkable creamy sauce for the pasta. Lately I have been thinking about starting to blog again, and with the addition of a server to my house (more of this in future posts) I was able to bring up a WordPress installation right here in my office. So this short little post is basically a test to make sure that everything is working well. Hopefully, this post will be in my blog, “The Long and Winding Road“, and will be pushed over to my Facebook page as well. To get started I guess I will just post a little about what has been going on in my life over the last year or so. Just over a year ago, I started a new job with a small company called Need I.T. Now. We are an IT services company specializing in small to mid-size business. I have worked for NITN in the past. Years ago, I saw a posting somewhere for a Novell expert. I answered and I got the job. It was a small temporary job, but it put me in touch with the owner of the company, AB. Fast forward a few years, and I was out of work. I got in touch with AB, and he gave me a part time job doing tech support for his clients. It was a great act of kindness, and in actuality the highest level of Tzedakah. After a time I did get a job, again in NYC as all of my jobs have been. Any time I was working in the city I would always keep my eye out for New Jersey jobs because I was tired of commuting into New York. I applied for a number of different jobs, and a few of them even went as far as their checking my references, one of which was AB. I get an email from AB asking if I was looking for a job because he was contacted as a reference. I said that I had a job, but would welcome a new job in NJ. One thing leads to another, and now it is just over a year since I started working for him full time. About 90% of my time is working in my home office. I get sent tickets and then I call the client and fix their problems. Simple! So far this has worked out well and I hope to keep working for NITN for many more years. So that’s it for now. I am really going to try to write at least a few days a week, if not more, so stay tuned for more travels down our long and winding road! Sunday was the Jewish holiday of Purim. For those who are not familiar, the holiday celebrates the story found in the book of Esther. I am not going to tell that story as it is available all over the web, and in the Bible. The holiday of Purim has three main Mitzvot. A Mitzvah, for my non Jewish friends, is not defined as a “good dead” as is often the case. A Mitzvah is a commandment, somehow based on the 613 original commandments found in the first five books of the Bible. In this case the three Mitzvot are hearing the reading of the scroll of Esther (the Biblical book), giving gifts to your friends and enjoying a festive meal with your family and friends on Purim day. That sounds great and these three are very easy Mitzvot to perform. Go to Synagogue to hear the reading, give a few gifts and have dinner. Not too difficult. And, in fact, our Synagogue was full on Saturday night for the reading of Esther. Kids dress up in costume and everyone has a great time. I think there were over 300 people at the Synagogue! Now here comes my rant. There is another principal in Jewish life called Hiddur Mitzvah or making the Mitzvah beautiful. The concept of Hiddur Mitzvah is derived from Rabbi Ishmael’s comment on the verse, זֶה אֵלִי וְאַנְוֵהוּ “This is my God and I will glorify Him” (Exodus 15:2): “Is it possible for a human being to add glory to his Creator? What this really means is: I shall glorify Him in the way I perform Mitzvot. I shall prepare before Him a beautiful Lulav, beautiful sukkah, beautiful fringes (Tsitsit), and beautiful phylacteries (Tefilin).” [Midrash Mechilta, Shirata, chapter 3, ed. Lauterbach, p. 25.] The Talmud [Shabbat 133b] adds to this list a beautiful Shofar and a beautiful Torah scroll which has been written by a skilled scribe with fine ink and fine pen and wrapped in beautiful silks. One of the most well-known ways observant Jews today fulfill Hiddur Mitzvah is to buy very beautiful Etrogim for Sukkot. Some people will, in fact, spend quite a lot of money on an Etrog, often well over $100. Now I have no problem with enhancing our observance of Mitzvot. I am all for it. But there has to be a limit. It seems to me that people are using Hiddur Mitzvah as a means to “one up” their neighbors. “They” spent $50 per gift basket this Purim so next Purim I am going to spend $75 per gift basket. This year I saw two different families being driven around in stretch limos delivering their Mishloah Manot (Purim gift baskets). This made me quite angry (I saw it last year too but for some reason it got me more this year). I think there needs to be a limit to Hiddur Mitzvah. How much money did these families spend up Purim? I have no idea on the cost of their baskets but I am sure it was not small. It is not impossible to think that their Mishloah Manot cost over $1000 when you include the limo. For what? Of course it was to fulfill a Mitzvah, so that is good, but they easily could have fulfilled the Mitzvah with small baskets that they themselves drove around town. Perhaps the $900 they saved could have been donated to Mazon or many other charities whose missions is to deal with the problem of hunger in our society. It is time for the Rabbis in these communities to put their feet down and say enough! No one should spend more than $36 for an Etrog. No one should build 500 square foot Sukkot and move their living room into it. No one should deliver Mishloah Manot by Limo. In the Torah’s context (not the Haggadah’s) this mini-history of the Jewish people is to be recited when a person brings their first fruits to the temple for a sacrifice. One interesting thing is that, according to the Talmud, a person did not just recite these verses, but the priest in the temple would recite the verse word by word and the person bringing his first fruits would repeat the words and the priest said them. Another example is during a wedding ceremony. When a bridegroom says the special verse of betrothal: הֲרֵי אַת מְקֻדֶשֶת לִי בְטַבַּעַת זוּ כְּדַת מֹשֶׁה וְיִשְׂרָאֵל “Behold you are consecrated to me, with this ring, according to the laws of Moses and Israel”, it is also said by the groom repeating the words as the officiant says them under the Huppa. Also at a wedding it is traditional for a groom to say some words of Torah at his Tisch (literally a table, but a small ceremony before the wedding when certain legal documents are signed) but the attendees interrupt him with song so he cannot say anything. All of these things are done so that one person is not set above another. In the first two cases, some people may know Hebrew very well, and some not. But if they have to repeat word for word the verses, then everyone is the same. Even the greatest sage has to repeat the words that are said to him. In the third case, at the Tisch, the friends interrupt with song so that no matter the groom’s abilities or learning, all grooms are seen the same. I am not a Rabbi and I have no authority to get people to do anything, but I feel very strongly about this issue. I hope that others, who are reading my blog will think about this and if you have similar feelings about this, speak with your Rabbi to learn his or her views. I have posted my Hamentashen recipe twice before in my blog (here and here). For the first time in more years than I can remember, I have made some changes to my recipe. If you can hold back you gasps, I will explain and post my new recipe below. I have been baking for many years now and I have a number of items that I have always done in a particular way. I also have a go to book for Jewish baking that I consult with all the time. The book is called “A Treasury of Jewish Holiday Baking” by Marcy Goldman. This is a great cook book and covers all the basics of both baking in general and Jewish baking in particular. If you want to learn about baking, buy the book. If you already bake, buy the book. It has helped me numerous times. I have not really looked at another recipe in a long time. People had given me recipes over the years and I have glanced at them, but I always said to myself, mine was better. Year after year, I would taste other homemade Hamentashen that I would get on Purim, and year after year I was satisfied that mine were the best of the bunch. Today I decided to just take a look at Marcy Goldman’s Hamentashen recipe. I was somewhat surprised that the recipe was very close to my own, with some significant changes. First off, she had more flour in the recipe than I did; significantly more. My recipe as printed in my blog had two cups of flour for ½ cup of shortening. Her recipe was double mine, and as printed said “at least four cups of flour”. It seems the same, but one of my little secrets was that I did not follow my own recipe and I used closer to 1 ½ cups in my single batch, or 3 cups in a batch equal to hers. That meant that she was using a whole cup more than me. If I were to put that much extra in my dough, I felt it would dry up much too quickly. Then I noticed that she dealt with that problem by adding more liquid. I call for 2 teaspoons of vanilla in my double batch (or orange juice) and she called for ¼ cup of orange juice and two teaspoons of vanilla. I had two eggs and she had three. The only other difference was the lower amount of sugar that she used. I had two cups, and she had a cup and a half. I think as I have gotten older, my need for the extra sweetness had lessened, so I was open to this idea as well. Here, then, is my NEW Hamentashen recipe, based on my original recipe and Marcy Goldman’s. 1. In a standing mixer, cream the margarine and the sugar with the paddle attachment until light and fluffy. 2. Add the eggs one at a time and mix in until the mixture is smooth. If it looks like it is curdling, add a few tablespoons of flour to bind it together. 3. Add the orange juice and the vanilla and mix well. 4. Add the baking powder and salt and mix well. 5. Add half of the flour and mix in, and then mix in the rest a half cup at a time until the dough holds together well but is still somewhat soft. Depending upon the humidity (which should be low this time of year) you will need to adjust the amount of flour. I think I added about 4 ½ cups. 6. Take the dough out of the bowl and put on a lightly floured board. Bring the mass together into a large ball and flatten slightly. Let the dough rest for at least 15 minutes. You could refrigerate the dough at this point and use within 6 hours or freeze it and use within a few weeks. 7. Separate the dough into quarters and roll out each quarter to about 1/8 inch thick. Using a 3″ cookie cutter or similar sized glass cut out rounds. Stack the rounds on the side and take the remainder of the dough and add it to the next quarter and roll it out and cut the rounds. Keep repeating this until you run out of dough. Rather than explain fillings and how to shape the Hamentashen, I recommend going to my friend’s website, The Shiksa in the Kitchen. She has a bunch of recipes for fillings and some great images showing a wonderful technique in shaping the Hamentashen. The only thing I will add to her info is that if you want to purchase fillings, the best you can get is Solo brand pie filling. It’s no secret that I am in love with the show Les Miserables. I went to see the movie on the first night and I have seen the musical on stage 5 times. My Facebook page has been filled with posts about Les Mis and I was talking about it all of the time leading up to the movie. The Musical is now the longest running show in the world (well, actually The Fantastiks ran longer, but that was off-broadway and everyone wants to overlook that). It is still running in England and for a short time it was actually running in two different theaters at the same time! What is it about this show that has captured the entire world? I have been pondering this question for the past week or so and I have come up with a couple of possibilities. You have to first go back to the book Les Miserables by Victor Hugo. This book, which is one of the longest books ever published, was an amazing success when it was published in 1862. Hugo was born when Napoleon was still in power and for much of his youth he was a committed royalist. However, as he grew and saw more of France he became a Republican and through his writing a defender of the poor and mistreated. I said recently that is he were alive today, he would have been with the occupy wall street movement. Les Miserables, which was his last novel was his message to France about the social injustices that he saw through his life. The book has two stories running throughout. The first is the story of the June 1832 Paris uprising and the other, which is more well known, is the story of Jean Valjean. The first story is the story of social justice. The second story is a story of love and redemption. I think it is these two themes that captures the hearts of the novel’s readers. The musical strips away much of the social justice story and focuses on epic story of Jean Valjean, a man who was jailed for stealing some bread and ends up spending 19 years in prison. The 1832 uprising does play a big part in the musical in the second act, but it is Valjean’s story that is dominant. We see a man who has fallen as far as one can fall and then he picks himself up, recreates himself and ultimately learns to love and be loved. There is probably no greater story than that. On December 25th at 7:30 we saw the movie Les Miserables. Let me start by saying is was amazing. One of the best film experiences I have ever had. It is certainly one of the best movie musicals ever made. I can throw lots of praise on it, but instead I will try to explain why I think it is so good. First off before saying anything about the movie, I have to say that anyone that tries to compare it to the Broadway Musical is doing an injustice to both the film and the stage musical. The musical film is based on the stage version, but it is really a different performance. The major songs are the same, but there are so many little changes throughout the film, that it is a new production. That being said, I know it will be hard for most people to refrain from making comparisons. I will endeavor not to do so as much as possible. Here are a few reasons why this is an exceptional film. Much has been said about the fact that they did all the singing live. Most movie musicals are made by having the cast do all of the singing in the studio and then when they do the filming (sometimes up to a year later) they lip sync to the recorded music. The problem with this is that they have to make certain acting decisions when they are recording the music which is hard when they are not in costume or on set. A year later they may not even remember what they were thinking when they did something in the singing. Filming live singing on the other hand, allows the actors to act while they are singing and allow the way they are singing fit the scene they are filming. They can also do multiple takes and make slight changes in the way they sing. The result is really nothing that has been heard in a movie musical before. I will not give specifics so people who have not seen the film will not have too much information, but suffice it to say this was the way to go. There are many changes from the original stage musical. Having run for over 25 years Les Miserables has had many minor changes over the years. Some of that was incorporated into the film, but there are scenes they can do in a film that they cannot on the stage and those little scenes need more music and lyrics, and they certainly came through. When they made these scenes, they did not just make them up, they went back to the book and took them right from Hugo’s writing. As such there are a few things that are cleared up in this version that leave you somewhat confused in the stage version. The makeup and costuming are incredible. Go see for yourself! The acting and singing are amazing. Hugh Jackson is the perfect choice for Valjean. Many people thought that he was not right for the job, but he was perfect. Most movie goers will think of him as Wolverine from the X-Men, but his background is stage musicals. He conveys so much emotion in his singing and makes the transformation from a downtrodden convict to a wealthy factory owner to a wealthy recluse with ease. Anne Hathaway is, in my humble opinion the best in the movie. It is clearly her best role and her voice is angelic! Amanda Seyfried and Eddie Redmayne are great as Cossette and Marius, and Sacha Baron Cohen and Helena Bonham Carter are superb as the Thenardiers. That leaves Russell Crowe as Javert. Many say he is totally miscast and his singing is not up to the standards of the rest of the cast. I can only say that I agree that his voice is the weakest in the bunch, but his treatment of the song “Stars” is fantastic and his acting is beyond reproach. He conveys so much from a single glance without anything being said or sung. This production allows people who never had the chance to see Les Mis on the stage to experience its majesty. I strongly urge everyone to see it! Here are a few clips from the film. You can see some of what I am talking about in terms of acting choices in the singing. I learned a lot over the past week. We have been through Hurricanes before and we will go through more as time goes by, but this one was the first that caused a level of devastation that we had never seen. Here are a few thoughts (in no particular order) now that I have had some time to think about the past week. We take electricity for granted. There are many times I have told my children how they take things for granted. How they have things that we never dreamed we would have when we were their age. Our children’s lives are easier than ours in the same way our lives as children was easier than our parents’. One of the few things that we ALL take for granted is electricity and other major utilities. We have had power outages in the past, and in the 1999 we even went two days without power. During Sandy we were without power for almost a whole week and I know that there are other people out there that are still without. We love having electricity flow through out homes and into our ipads, Wiis and laptop computers. The truth is though, that most of us have very little understanding on how it works and how it gets to us. I think that we all need to take an opportunity to not only learn a little about this “magical” energy that powers all of our devices, but to get an understanding of where it comes from and to be more respectful of it. Electricity does not just exist like water and air. It has to be generated and need to be mindful of this at all times. Perhaps one of the best parts of being an observant Jew is that we are more in tune with energy that most of the population. We spend 25 hours of each week with our powered life shut down, but even so, we are still out of tune with the bigger picture and even a few hours of no power during the week becomes a burden. So I think we should teach our children about how energy works and make them aware of where it comes from. Relocating is difficult. After two days of no power we moved into my in-laws house which is around the corner from ours. Over the years we have seen areas that are devastated by natural disaster and people are relocated. It always happens to “other people” and while we fee for them and perhaps donate money or goods to them, we don’t really understand. In truth, we were able to move in with my in-laws and don’t fully understand either. But the act of having to pick up and leave your home because it has become un-livable is hard not only from the standpoint of packing and physically moving, but from knowing that your home, what you have spent years building up is now unusable. Some in our neighborhood stayed in their homes. I wonder if they did this not because they had no place else to go (there were lots of people with power offering to house others) but because they just did not want to leave their homes. Luckily in our community there were a few places to go to get warm. Our Synagogue opened its doors to the community and many people took advantage of the heat, coffee and internet. Crisis brings out the best in people. Everywhere people were opening up their homes, their wallets, their pantries and their freezers to help people in town who were without. Of course on the news you see stories about large relief efforts, but you really need look no further than your own home town. As soon as power came back to our Synagogue, the doors were open to the entire community. The same is true for the Reformed Church and one of the Orthodox Synagogues in town. Everyone was there to lend a helping hand. There were Christians, Orthodox Jews and Muslims in my Synagogue over the past week coming together to help help each other in a time of need. If that does not inspire us all to do more, I don’t know what will. Crisis brings out the worst in people. Once people were able to go out and purchase gasoline, the prices generally rose at least 30 cents per gallon. There were some honest gas stations where prices were at the same rate they were before the storm, but it seems quite widespread that the prices went up too high. There is a law in NJ that states during a state emergency, merchants cannot raise prices more than 10% more than the price would be if there were not an emergency. The NJ Department of Consumer Affairs got hundreds of complaints over the past week about price gauging and the Governor has stated that they will find and fine everyone who broke this law. If ever there was a time to practice decency and help others, this was it, and many merchants failed miserably. D Cell batteries are still important (thanks to Alisa Berg for that one). You don’t really need to purchase tons of milk and bread before a hurricane. Finally, my disaster of a garage that I prayed to fall down, will probably survive a direct hit from a cruise missile. I hope everyone is safe and warm! Ok everyone put your thumbs up high in the air! “Oh USY, Oh USY, for you we live for you we die! Oh USY, oh USY, for you we live for you we die! You gave us spirit, lots of luck; you even taught us how to … fool around. Oh USY, oh USY, for you we live for you we die! Any current USYer reading this blog is not going to know that little ditty, but most of my friends sure will (and any staff out there, sorry!) Last weekend, my synagogue hosted the Hagalil USY regional Leadership Training Institute Kinus. There were about 140 high school students who came together to “do Jewish” for lack of a better term. For the kids, the weekend was about leadership and those who attended were the leaders of the region and many of the local chapters in New Jersey. But it was more than just leadership. It was about Jewish learning, prayer, friendship and fun. It was a great weekend for all involved and it really brought back a lot of my memories from when I was in USY. We had four boys stay in our house, one of whom was my nephew and one the son of one of my close friends from USY. It was really amazing getting to see the youth of today experiencing some of the same things I did in USY and I know that I was looking at future Rabbis, Cantors, Jewish educators and just committed Jews. It made me very happy to know that there is a secure future. But then last night I saw a disturbing video on YouTube that was shown at my Synagogue board meeting. This disturbing video brought me information of which I was totally unaware. When I was in USY, there were between 15,000 and 20,000 USYers in North America. We would have upwards of 1200 USYers at International Convention. USY Pilgrimage was bursting at the seams with participants. But now, with numbers like these, USY is in real danger of disappearing. At the same rate of by 2015 there could be 3000 USYers. There are hardly any large USY chapters with more than 60 members (there were a few in NJ when I was in USY). USY is a program that I want my children to be involved with, and if things don’t turn around, my seven year old daughter may not have much of a chance. On top of that, the Jewish community in general will suffer for the lack of USY. Many leaders in the Conservative Movement and in the general community are USY graduates. The second thing those of us in Conservative Synagogues can do is to open our doors to USY. When USY is having a program, stop by and see what’s happening! USYers would love to show you! Urge your congregations to sponsor USY if they do not, and to host regional events if they do. And when your Synagogue hosts a regional event, volunteer! Be there to serve a meal or to help set up a room. Open your home to USYers and have them stay in your house. These are experiences the kids will never forget and you will never forget. We’re all in it together. USY can have a very bright future but only if WE, the members of Conservative congregations, make a commitment to USY. The kids won’t jump up and join USY on their own, they need our encouragement. And once they are there, the rest takes care of itself. I can tell you that USY was the single most important thing in my high school years. I was a shy introvert before USY and USY changed me forever. I did not just decide to go to a USY meeting; my parents encouraged me to go. I did not just go to a USY kinnus; my parents suggested that I go. Once I was there, USY got me. I became the president of my local chapter, a member of the regional board, a vice president in the region and finally a member of the USY international board. My nephew who stayed at my home this past Shabbat is following a similar path (although he was not a shy introvert!). USY makes menschen (good people) and we need to step up and ensure its continuation. Finally here are a couple of USY promotional videos, and two of a USYers having a great time at shul!